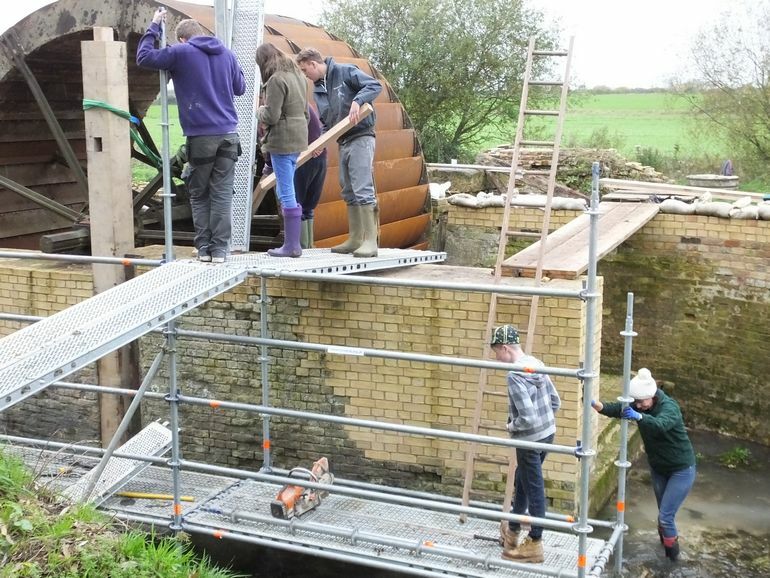 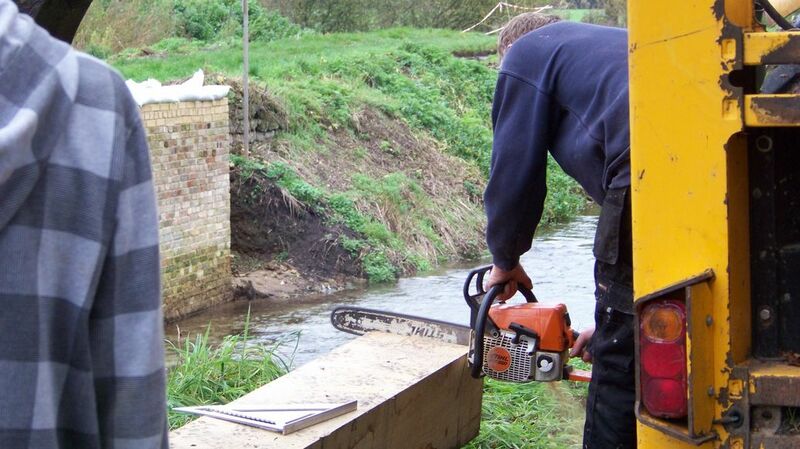 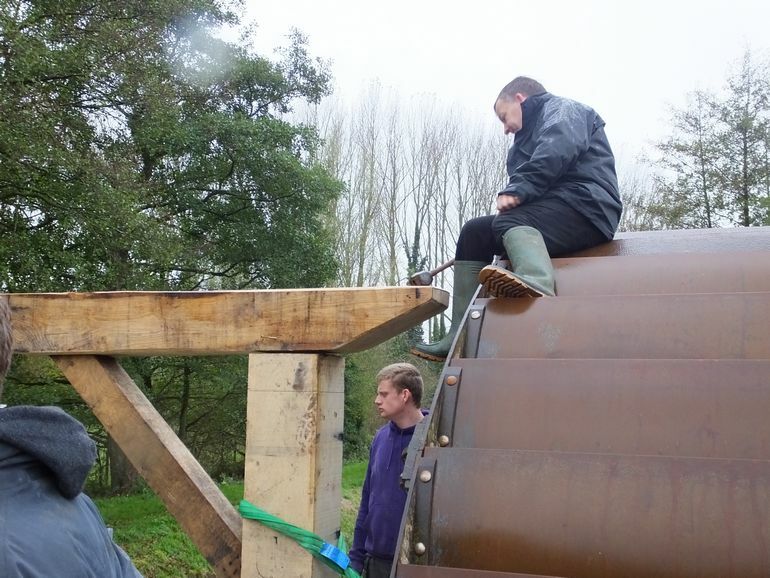 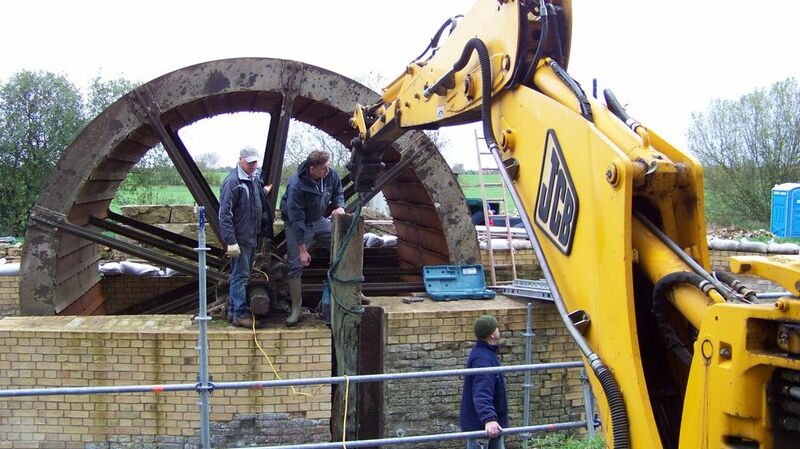 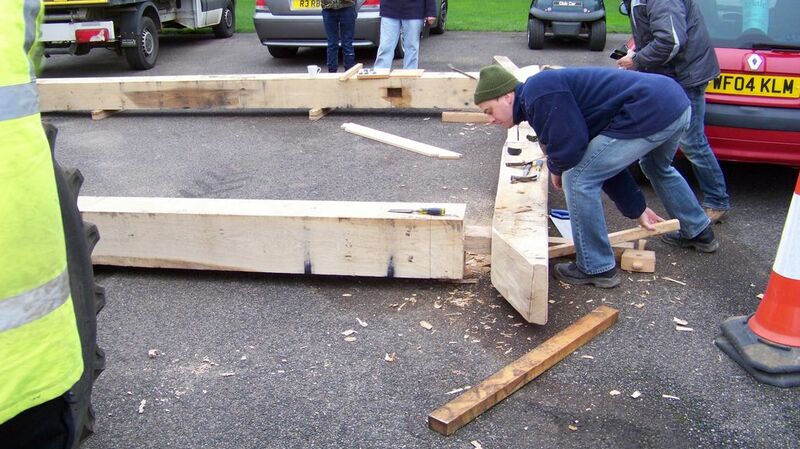 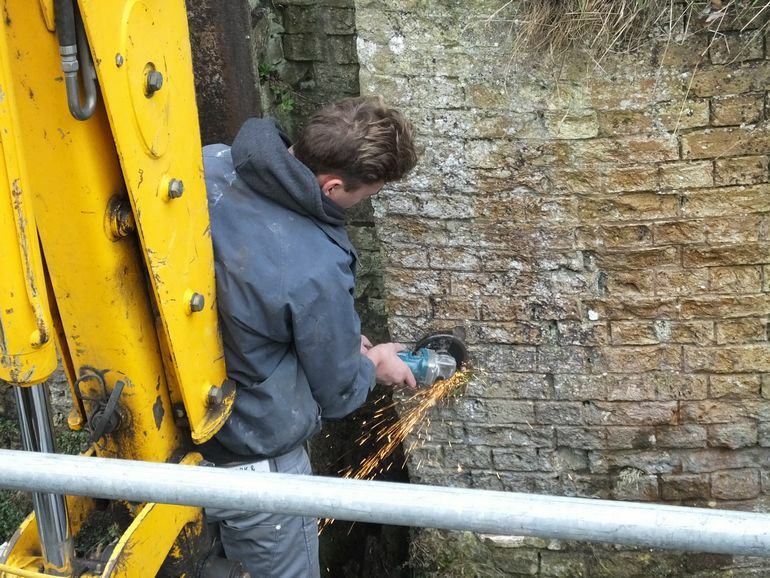 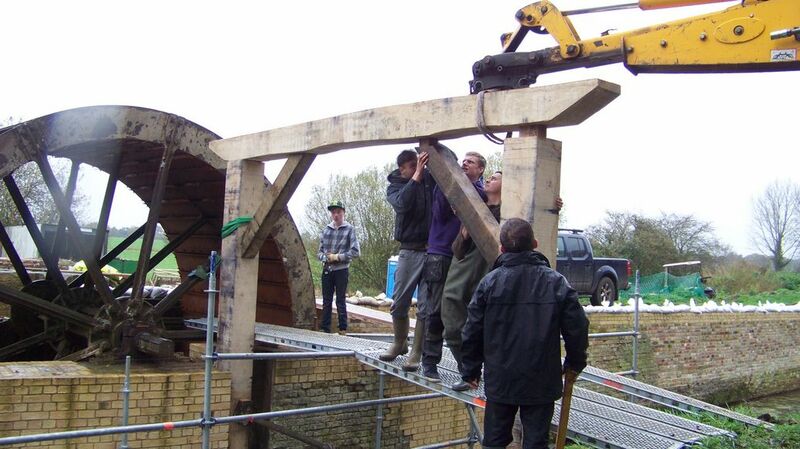 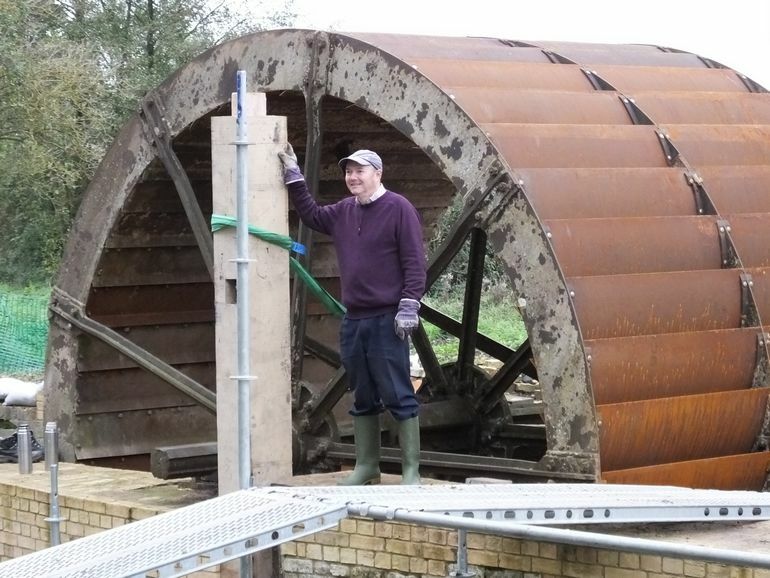 On Saturday 14/11/15 the gate frame was taken to the mill to be fitted. 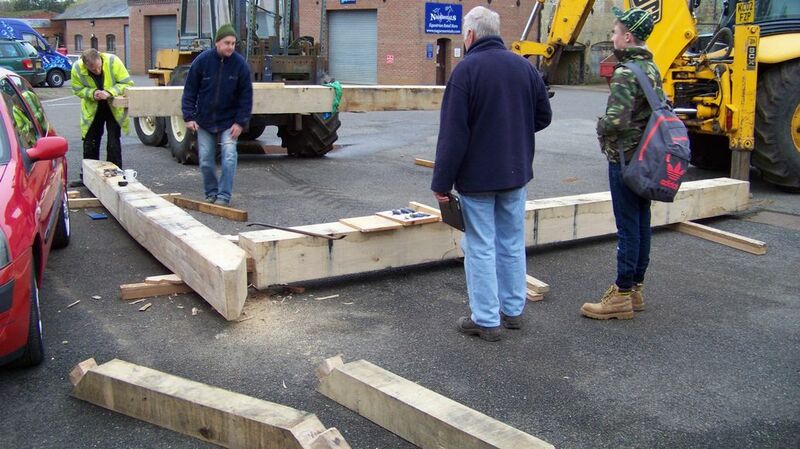 The structure had been made at The Maltings and a trial assembly and fine adjustments were made before loading all 5 pieces onto the tractor trailer with tools and equipment for fitting it in place. 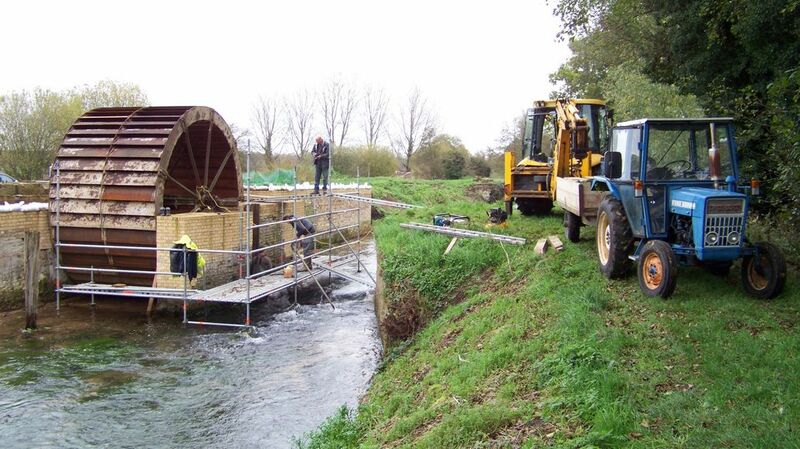 The only access would be from the opposite river bank as the water wheel would prevent working from the mill side as the digger would not be able to reach to get the parts in position so the digger and tractor and trailer had to go past the mill to the bridge, then back along the opposite bank to the mill. 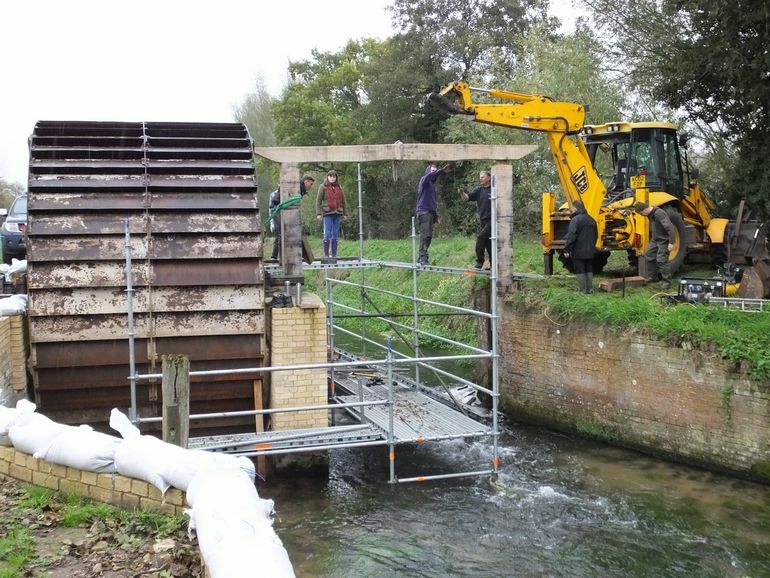 The first job was to put scaffolding boards across the river so we could access both sides and work next to the new uprights. 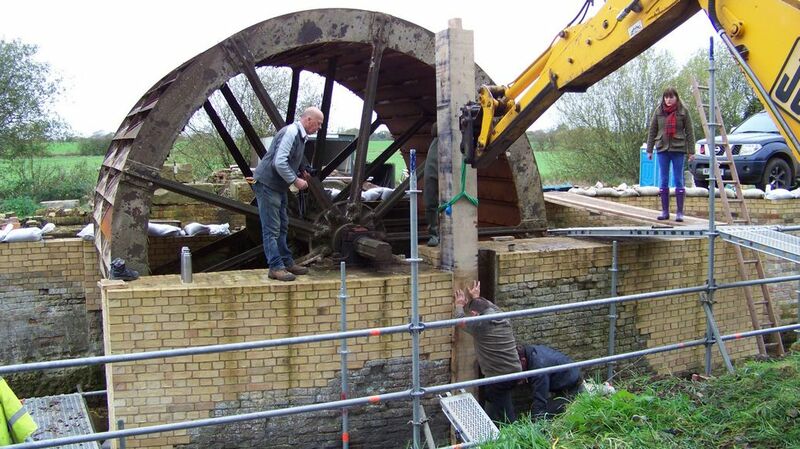 The old rotten upright next to the wheel was removed, bolts had to be ground away then the wood was pulled out with the digger, the last part below water level had to be chiselled away by hand. 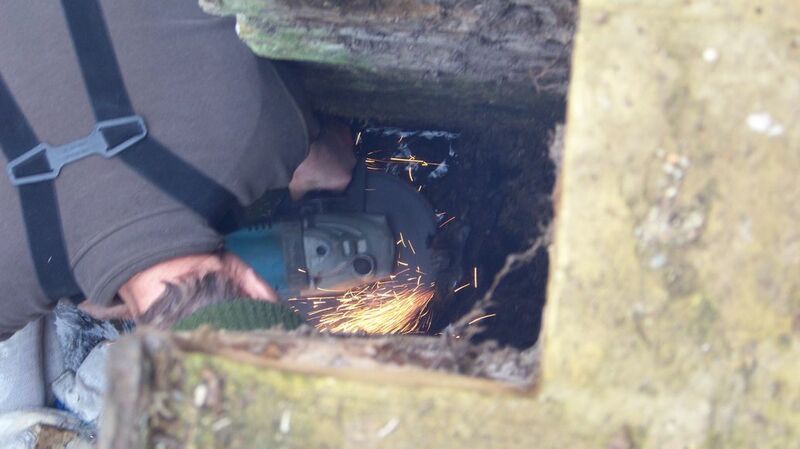 One of the original bolts was sticking up so the bottom of the new post had to be drilled to fit this. 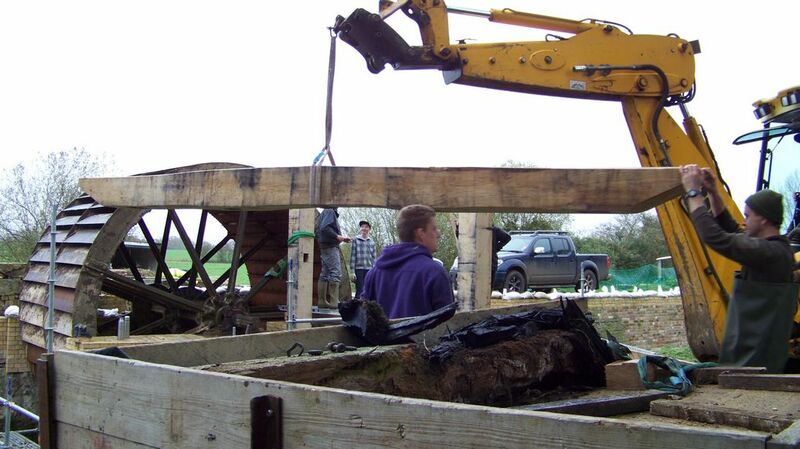 The first post was put in place by being lifted off the trailer with the digger and slotted in place, then tapped down below water level with the digger boom. 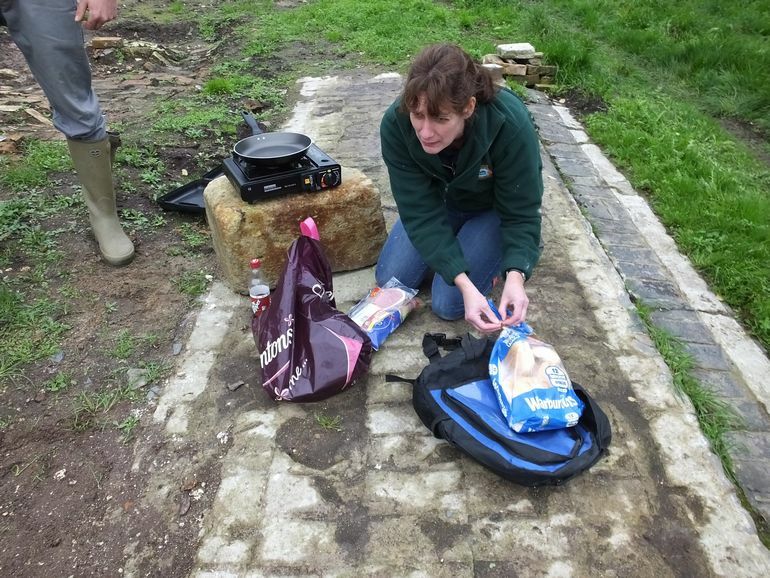 Debra brought a camping stove along and made bacon rolls for everyone which went down well as we had worked up an appetite. 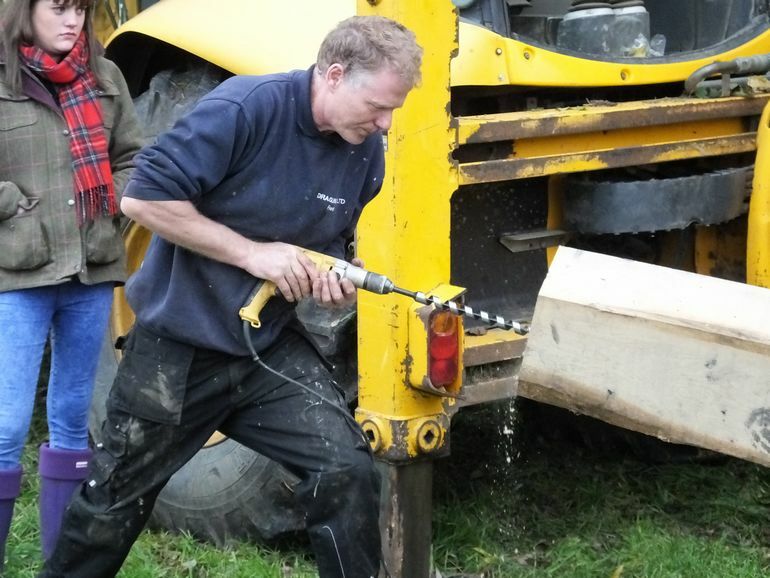 A metal channel had to be removed from the far side post position before the new upright could be put in place, and there was wood below water level this side too, so it had to be chiselled away. 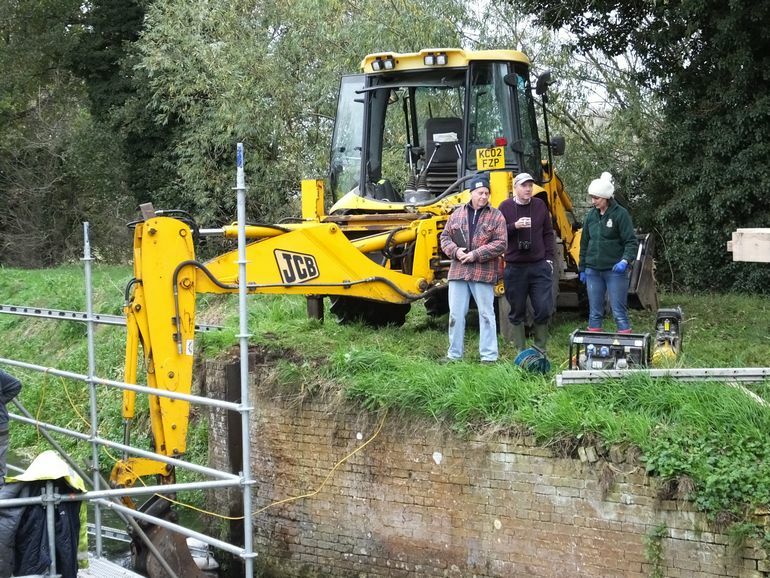 Scaffold boards and sandbags were put at water level so we could work in this area, placing the digger bucket where we could stand in it also helped. 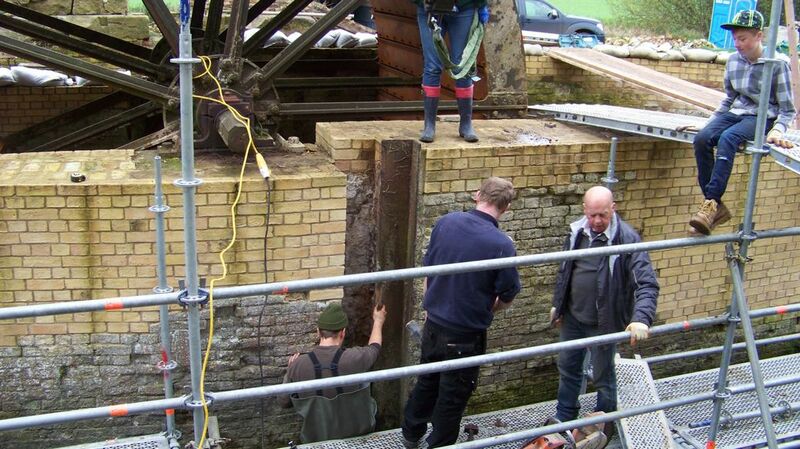 When the new post was trimmed to size and fitted, a screw jack was put between the uprights to keep them in position until they could be drilled and bolted to the walls. 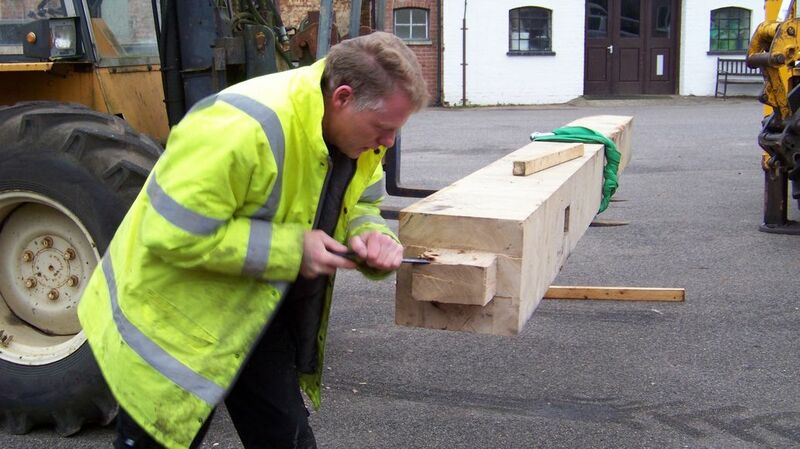 The top piece was put in place and fitted perfectly, then the angled struts were tapped in after lifting each side enough to slot in the joints. 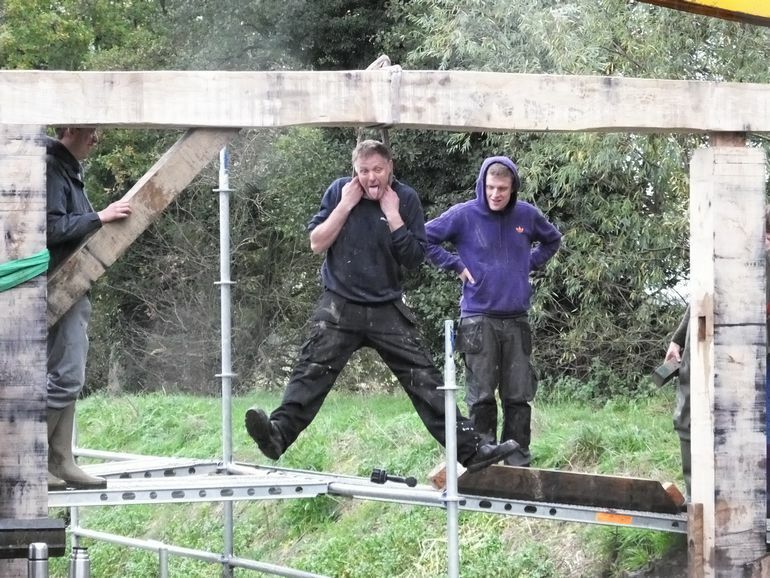 When the first one was fitted someone said the frame looked like a hangman's gallows, and Fred demonstrated this, see the picture. 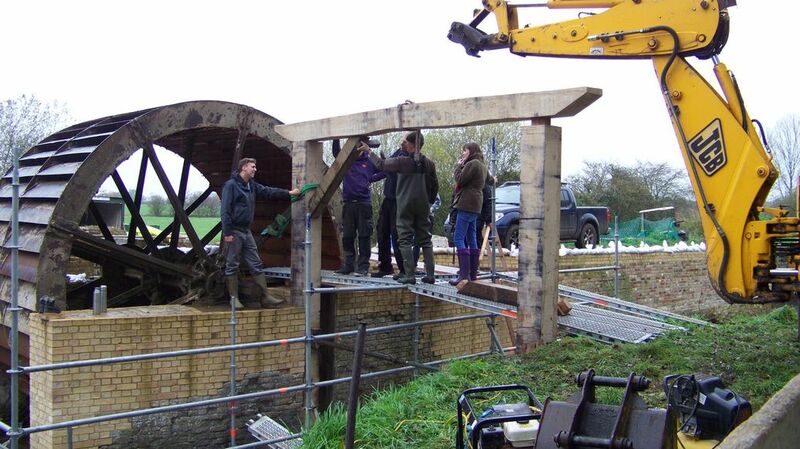 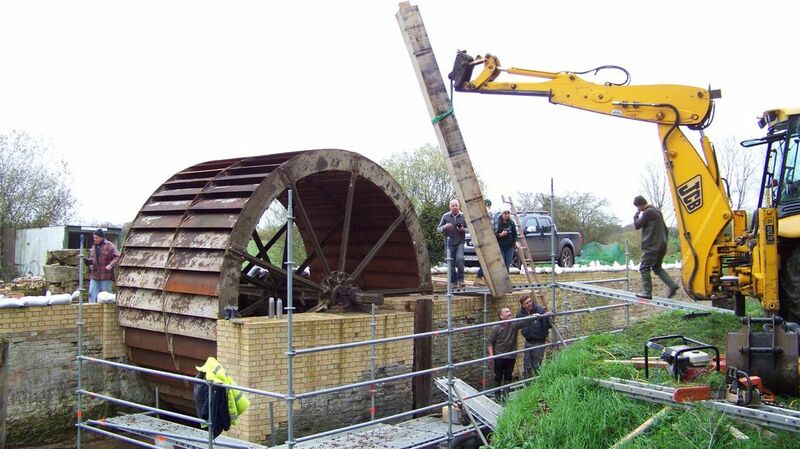 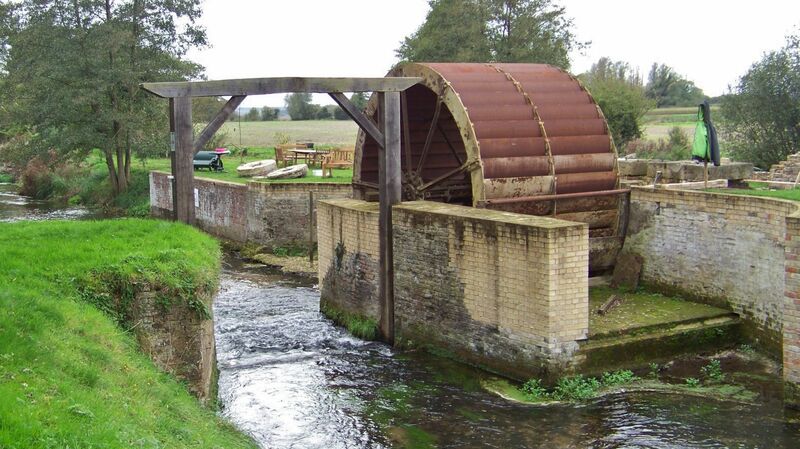 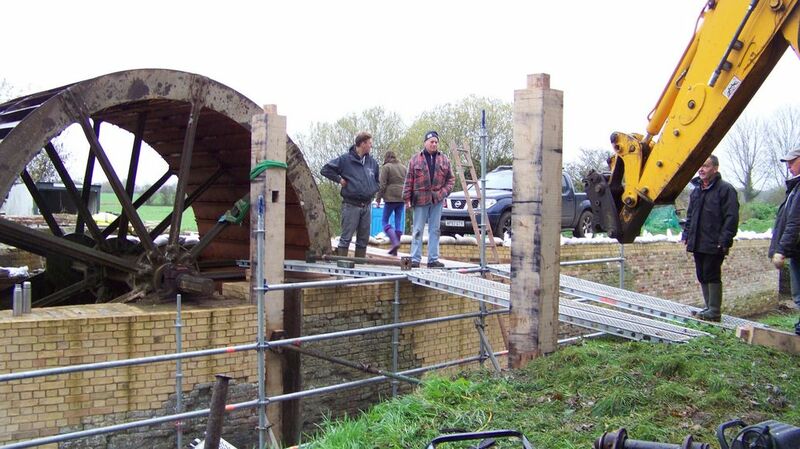 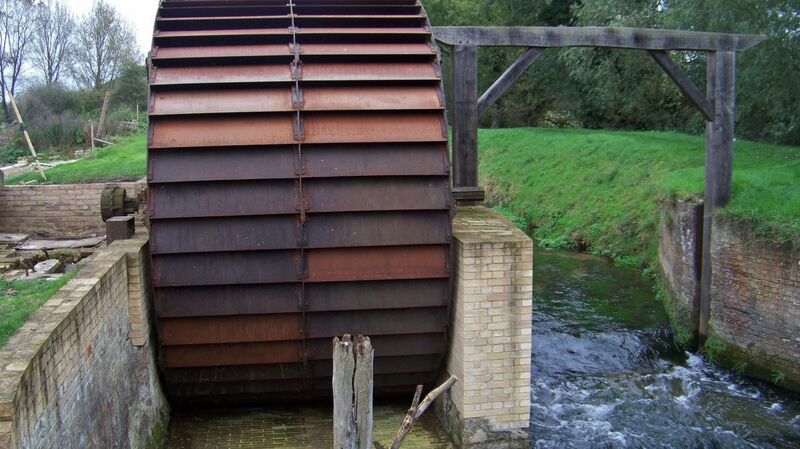 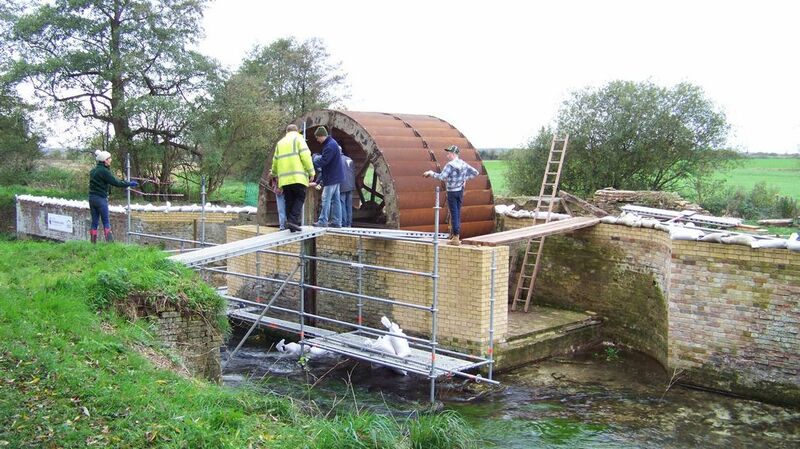 The new frame really sets off the water wheel and looks very similar to the original one in the old picture of the mill. 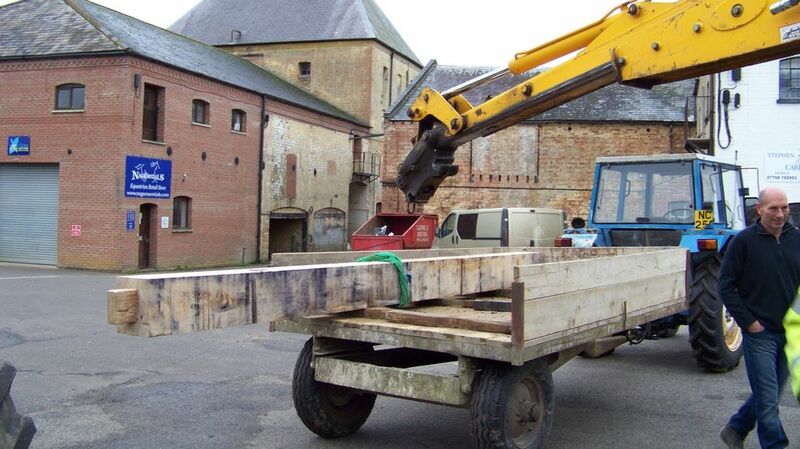 After 2 years the wood has aged and now looks a more natural colour.